Opening its bright blue pop-pom garlanded doors in March this year, The Woodsfolk has brought a breath of fresh air to the newly invigorated Church Street in Hawthorn. Having lived in the area for four years, I have seen a gradual and welcome transformation take place, with the likes of Maiike, Tana Cafe, and MADE. Beauty Space now among my favourite haunts for a spot of retail (or facial) therapy. But I digress. Back to The Woodsfolk. This whimsical retail nirvana serves in part as the shopfront for local homewares and lifestyle label, Down To The Woods. Created by local design talent, Amber Clohesy, you're sure to have seen the charming DTTW freckle rugs and ottomans, vibrant wire baskets, cheery 'hello' welcome mats, and old fashioned forest animal bedside lamps popping up around town. There's definitely a touch of nostalgia about Down To The Woods, and the brilliantly curated selection of goodies at The Woodsfolk will delight the inner child in any grown up. Although full to the gills (you could lose HOURS in there! ), the fashion, beauty, stationery, soft furnishings and accessories are beautifully merchandised, so you can admire each and every piece. And you'll want to. 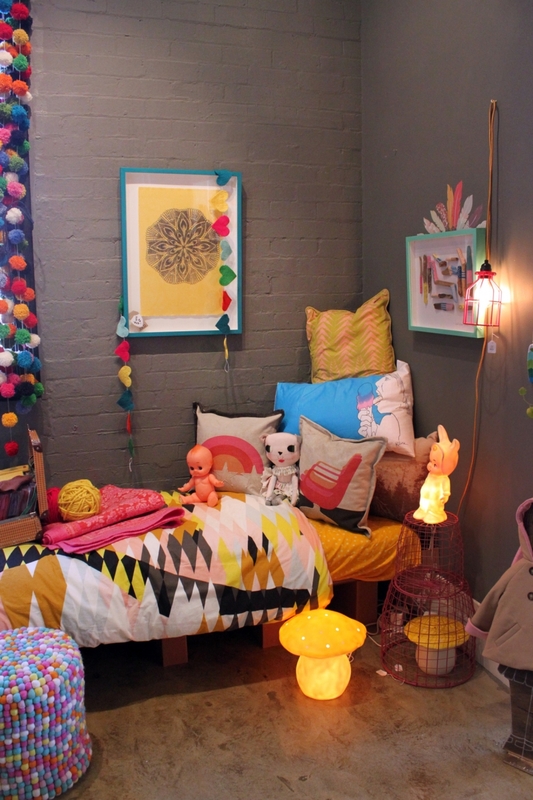 For starters, there's quirky bedding from newcomer Kip & Co, beautiful handmade dream-catchers by Made by Mosey, mud australia ceramics, pastel jelly-mould hanging planters from Angus & Celeste, jewellery from Polli and A Tale of Two Cities, gorgeous hosiery from local label, LoveHate, and cute tea towels from The Club of Odd Volumes. Then there's a selection of slick homewares and furniture from Netherlands-based HK Living, men's skincare, tiny ceramic animals ('woodsfolk'), and a huge selection of unique cards, plus stationery from Rifle Paper Co and more. And that's barely scraping the surface! The backroom is dedicated to the little ones, with a mini bed set up, the before-mentioned animal lamps (ah-dorable), and the cutest little hooded felt animal coats from Little Goodall. You MIGHT want to leave the tackers at home though, as they won't want to leave. Heck, neither do I. Sitting on a sunny corner, The Woodsfolk takes you on a sweet and whimsical journey and is a must-visit when in leafy Hawthorn. Go down to the woods(folk) today.